I need help to identify this doll my mom had as a child. I do not want to sell it, just want to ID it. She called her a Ginny doll. She is 11 inches tall and has a walking motion with her head and legs. Her eyes open and close. She does not have any markings on her anywhere. She also has jointed legs. (One has been glued). She has auburn hair. I am pretty sure she is not a "Ginny" doll. She came in a blue trunk with lots of clothes and accessories. 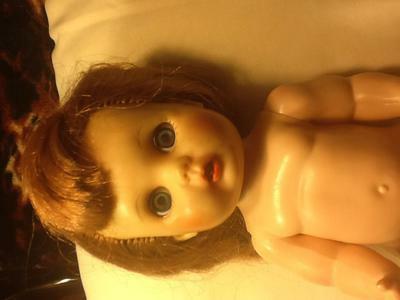 My mom just adored this doll and growing up she would occasionally take her out and show her to my sister and me. We were never allow to touch or play with her. She is a beautiful doll that gave my mother lots of joy!